ASICS seems to be carefully maintaining their position in the lifestyle market with a carefully directed trickle of the good stuff. From the sale racks in the mid ’00s to a position as the shoes of choice for those looking for an alternative to the same old same, they’ve found themselves in a lead position when it comes to early ’90s retro releases. 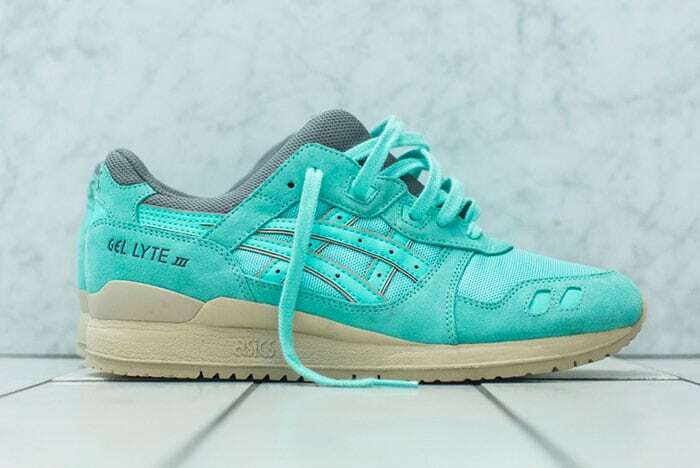 It’s a hare and tortoise situation in a lot of ways, but when you see Nike dropping a shoe like the Base II as an evident retort to the Gel Lyte II and Saga II’s current popularity, it’s doubly interesting when you consider the history between Nike and the Onitsuka brand. Whoever’s putting out the current colourways seems to be demonstrating a mastery of what makes these shoes good. Six years of escalating popularity post-Patta (try saying that after a coffee shop visit) are paying off. We don’t think there’s any thematic connection between these two releases in terms of colour concept, but they turned up his morning and we wanted to feature a different running shoe brand on this part of the site – the white, grey and mint (and people really seem to love minty shades on this shoe), with added speckles on the Gel Saga II are a good addition to the collection, but that purple Gel Lyte III is a good one too, with a shade of yellow as accents, plus a shade of blue on the inside that’s another ASICS favourite too. We know ASICS has got plenty more in the archives waiting to continue the takeover too, because they never fell off — sure,“proper” running shoes got a little more ugly during the late 1990s and 2000s, but this is a brand that has always been about no-gimmick performance. They don’t need to synthesise a storyline or cultural attachments, because the ASICS legacy is Teflon status. Nike breaks out some HTM Flyknit hype to celebrate Milan Design Week. New Balance M998RR: More Maine-made masterpieces.